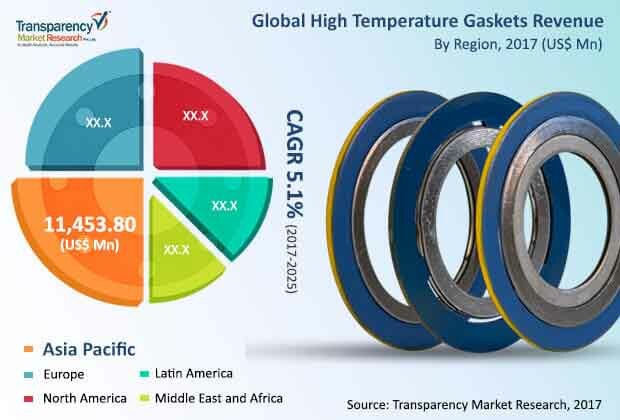 The global high temperature gaskets market features a largely fragmented and thus intensely competitive vendor landscape, according to a recent report by Transparency Market Research. While manufacturing techniques have changed over the years for high temperature gaskets, leaders have maintained their positions by adopting latest techniques, establishing a large inventory of materials, and competitive pricing. The market is expected to remain competitive in the years to come as well, with focus on strategic collaborations expected to rise as companies look to consolidate their positions in lucrative regional markets. Some of the key companies in the market are Flexitallic Group, Garlock, Teadit Group, Spetech, Hennig Gasket & Seals Inc., IGS Industries, Kommerling UK Ltd. 3M, Henkel Adhesives, National Engineering Products Inc., and Advanced Sealing. According to the report, the global high temperature gaskets market was valued at US$20,399.9 mn in 2016 and is projected to reach US$31,640.0 mn by 2025. This translates into a CAGR of 5.1% from 2017 to 2025. Of the key varieties of materials used for manufacturing high temperature gaskets, the segment of graphite accounted for nearly 16% share of the global high temperature gasket market in 2016 in terms of volume. This can be attributed to its properties of flexibility and resilience at high temperatures. Currently, liquid gasket sealant for ultra-high temperature constituted minimum share of the market. However, the segment is anticipated to expand significantly during the forecast period. Geographically, Asia Pacific accounted for more than 50% of the global high temperature gaskets market in 2016, in terms of volume as well as value. It is likely to offer significant potential to the high temperature gaskets market in the near future, with China being the dominant country. Presence of a large number of transportation companies, power generation plants, and chemical processing plants in China will aid its growth. The market could benefit from steady growth opportunities in some of the key end-use industries such as power generation, oil and gas, transportation, and chemical processing. Emerging economies in regions such as Asia Pacific and Latin America have witnessed a vast rise in power generation infrastructure set-up activities. In advanced economies, demand is instead driven due to the rise in power generation infrastructure maintenance activities. Revival in the automotive industry across established and emerging markets is also likely to present growth opportunities for players. Recovery in oil prices and increase in demand for maintenance of oil field equipment are anticipated to boost the high temperature gaskets market in regions with an established oil and gas sector, such as the Middle East and Africa region. Ultra high temperature liquid gaskets are gaining market acceptance in the region due to their compactness in use for drilling equipment where the design of the flanges is critical.